As an integrative counsellor I combine diverse counselling and healing modalities because it is effective in supporting my clients exactly where they are in their lives. The modalities I combine depend on my client’s ever changing needs. Everyone is so unique, and it’s that distinctive difference that makes us who we are. My purpose is to uncover my clients’ soul-essence and bring it to the light of their conscious awareness. My work is based in Transpersonal Psychology, an approach that integrates the spiritual, transcendent aspects of the human experience within the context of everyday life. The transpersonal is defined as altered states of consciousness and spiritual experiences that encompass a wider perspective of life, the psyche and the universe. By tapping into the interpersonal, you move beyond familiar perceptions of reality into greater levels of awareness and soulful epiphanies, which enriches your spiritual life as well as your personal well-being. I have a deep respect for the magic that occurs in the healing session. The modalities listed below are tools for deep transformational healing and personal breakthrough that never cease to amaze me. Person-centered and Trust-oriented therapies recognize each person as intrinsically whole and resourceful, which engenders self-acceptance and inner confidence. Body-centered therapy is a somatic approach that incorporates the mind, body, spirit and emotions in the healing process. Somatic Counselling is designed to relieve post-traumatic stress, and address the way in which a person’s thoughts, attitudes, feelings and beliefs have an impact on his/her physical and emotional functioning. Hypnotherapy is a safe tool for exploring unconscious beliefs and patterns, and cultivating a deep sense of comfort. Focused-oriented Psychotherapy is a somatic-based modality for uncovering unconscious awareness through felt-sense experience. Non-Violent Communication is empowering and necessary for conflict management and communicating from the heart. Spiritual Counselling helps you bridge your spiritual and human experience and cultivate faith. Channelling (or Channeling) is a powerful healing tool for personal breakthrough and for understanding your karmic purpose and who you truly are. Vibration Medicine frees contracted holding-patterns within the nervous system and muscles, and re-patterns cellular memory. It is an ancient system of healing based on the principle of energy. Our body is composed of energy pathways which are affected by our thoughts and beliefs. Vibrational medicine focuses on re-balancing those system. Person-centered counselling, also known as person-centered therapy, client-centered therapy and Rogerian psychotherapy, was developed by psychologist Carl Rogers in the 1940s and 1950s. It is a form of counselling that regards the client as resourceful, and provides him/her with empathic understanding and unconditional regard. It’s a form of reflective listening that is engaged and supportive. Trust-oriented Therapy was designed by my mentor Mahmud Nestman. It is a form of counselling intended to create a climate of safety and welcoming where symptoms and concerns are not seen as aspects of a dysfunction to be eliminated as quickly as possible. Personal issues are viewed as incomplete or symbolic expressions of human needs. Ericksonian Hypnotherapy uses indirect suggestions with metaphor, story-telling, suggestive phrases and tones of voice, to help you become aware of your thought patterns. You remain conscious during the hypnosis and able to connect with your own personal experience. Hypnotherapy is a safe tool for exploring unconscious beliefs and patterns that may be the cause of current issues and concerns, as well as it helps you enter into an altered state of consciousness that supports a meditative state of rest and tranquility. Hypnotherapy is profoundly rejuvenating as it helps release the minds habitual tendencies and create the changes you long for in your life. Focusing-oriented Psychotherapy, also known as Focusing, is a process developed by psychotherapist Eugene Gendlin. It involves non-judging attention to a somatic sensation—a bodily feeling. This somatic experience is sensed inwardly in the chest or throat, and the abdomen, and is the connection point for one’s intuition and inner knowing. It brings one’s boundaries, needs and desires into focus. Focusing differs from the usual attention we give to feeling, because it occurs in the subtle felt-senses between the conscious and the unconscious mind. Through focusing, you attend to the sensitive border between your conditioned beliefs and your longing, and find at the edge of physical and subtle sensations a profound sense of relief. 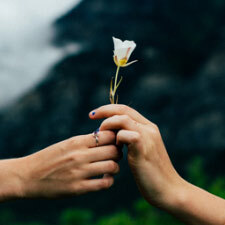 Nonviolent communication is a compassionate and collaborative approach to conflict resolution and heart-felt intimacy – a communication process that was developed by Marshall Rosenberg beginning in the 1960s. NVC focuses on three empathic characteristics of communication: Observation (being a nonjudgmental witness, Reflective active-listening (relating to the person sharing his/her thoughts, judgements, feelings), Self-expression (authentic and vulnerable transparency). Spiritual Counselling is a holistic approach that honours the whole person with the emphasis on integration, and focuses on what is naturally wanting to unfold in a client’s life. With spiritual counselling, a safe and welcoming space is held for the emergence of a person’s spiritual essence. All issues and concerns, emotions and longings are viewed as the stirrings of the soul, and as fodder for healing. “The assumption is that human beings are innately motivated towards achieving their highest potential of awareness and fulfilment; the counsellor’s role is to support this and trust the client’s process,” explains Collette Barnard. The purpose of a spiritual counsellor then is to help the client heal the ego by developing the nonjudgmental witness—a process of integrating the ego with one’s essence, establishing a strong union between body and soul. Channelling is the process of partnering with the Divine, imparting words of wisdom or energy and creativity. Channelling can inform gifted healers, as they lay hands and allow the healing to occur through them. Artists and musicians surrender to the creative process of creation and tap into a wellspring of challenged energies. Many writers say that the words just came to them; the poem wrote itself; the song emerged naturally. Conscious Channelling or Channelled Healing is the process of communicating with disincarnate higher-consciousness to gain clarity and support spiritual growth. It’s an active approach to getting out of the way but still remaining alert, that requires quieting the critical mind and allowing one’s subconscious to support the cognitive structure of the spirit-communication. A conscious channeller partners with spirit to raise the vibration of the human experience by surrendering control, yet remaining ever present and available for transformation to occur. Vibrational Medicine promotes the body’s natural ability to heal itself. It is a holistic approach that looks beyond the physical to address subtle and emotional levels where the cause of discomfort, dis-ease and personal issues originate. Energy healing works with meridians, chakras, and cellular re-patterning, and approaches the whole person: body, mind and spirit. The entire structure of the human organism contains trillions of cells, the basic unit of life, which works together to form the organ systems. When these systems are out of balance, they surface as physical illness and a lack of mental and emotional clarity. All our beliefs, attitudes, thoughts and emotions send energy waves to every cell in our bodies, which shape the level of cell balance and affect the health of all operating systems. Cellular health becomes depleted when outmoded conditioning and programming limit the energy waves. Energy-healing helps reprogram these messages with new life-affirming frequencies, supporting physical, emotional, spiritual and mental well-being. Connect with the blessings of who you truly are.